Magazines, media, big Wall Street firms, and most advisors are actively promoting a false narrative they want you to believe. The reason they push this narrative is because it makes them a lot of money. In The Effective Investor, Mark Lund exposes this false narrative, explains how it is used, taught, and promoted, so that you too will be able to recognize it. The good news is that you don’t need their speculative ways of investing in order to be successful. This is the dirty little secret in the investment industry that they don’t want you to know. With proper strategies and information you can achieve a level of confidence and peace with your investments and retirement plans that you never knew was possible. What kind of stocks will give me the best returns? What is the best ways to protect my money? When should I be in or out of the stock market? What are the hidden fees of investing? What’s the biggest problem with mutual funds? It’s easy to get opinions on questions of this type. It’s hard to get facts. The answers are based on results that can be measured. This is the book your current advisor hopes you never read! 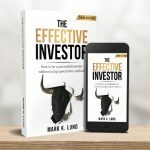 Sign up for a Free consultation and receive a complimentary copy of Mark Lund’s book, The Effective Investor.